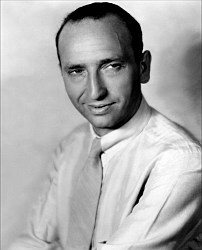 Michael Curtiz has, uncharitably, been described as a "workhorse director", a capable and reliable professional, always ready to take on whatever assignment was thrown at him. Such men formed the solid foundation of the classic Hollywood studio system. Curtiz was certainly capable,and reliable but he was more than that and he was responsible for some of the finest movies to be made during Hollywood's Golden Age. He made all types of movies - thrillers, romances, war movies, comedies, horror, and film noir. Yet his forte was action movies and swashbucklers, to which he brought an infectious style and energy. The Errol Flynn movies, particularly 'Captain Blood' in 1935 and 'The Adventures of Robin Hood' in 1938 still stand as examples of the finest action movies ever made. He was certainly prolific from the first, and he directed nearly 50 films under his birth name of Mihály Kertész in his native Hungary before moving to Austria in 1919, where he made biblical spectaculars in the Cecil B. DeMille style. He headed to the United States in 1926. Anglicising his name, Curtiz soon became Warner Brothers' top in-house director, entrusted with its A-list stars and productions. Over the next 28 years he directed over 80 Warner Brothers films, among them '20,000 Years in Sing Sing' in 1933, Captain Blood' in 1935, 'The Charge of the Light Brigade' in 1936, 'Angels with Dirty Faces' in 1938, 'The Private Lives of Elizabeth and Essex' in 1939, 'The Sea Hawk' in 1940, 'Yankee Doodle Dandy' in 1942, 'Mission to Moscow' in 1943, 'Mildred Pierce' in 1945 and, most famously of all, 'Casablanca' in 1942, which won him his only Best Director Academy Award. He had a gift for drawing the best from his actors, and he directed 10 different performers to Oscar-nominations. Losing nominees were Paul Muni, John Garfield, Walter Huston, Humphrey Bogart, Claude Rains, Ann Blyth, Eve Arden and William Powell. In addition, James Cagney and Joan Crawford won Oscars for their Curtiz-directed performances in 'Yankee Doodle Dandy' and 'Mildred Pierce' respectively. Six of his films have been nominated for Best Picture: 'Captain Blood' (1935), 'The Adventures of Robin Hood' (1938), 'Four Daughters' (1938), 'Yankee Doodle Dandy' (1942), 'Casablanca' (1943), and 'Mildred Pierce' (1945), of which only Casablanca actually won the Oscar. Curtiz married three times, firstly to Lucy Doraine from 1918 to 1923, then to fiery actress Lili Damita for one year from 1925 and finally to Bess Meredyth from 1929 to his death in 1962. After he left Warner Brothers in 1954, offended at being asked to take a pay cut, Curtiz continued to turn out a couple of movies a year on a freelance basis. One of these, the saccharine musical 'White Christmas' in 1954, gave him the biggest commercial hit of his career. Indefatigably productive to the last, Curtiz continued directing films until a few months before his death at the age of seventy-five on April 10, 1962. He is interred at Forest Lawn, Glendale, CA.